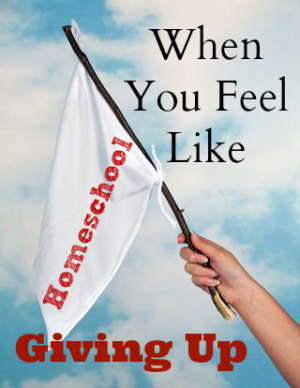 We all know homeschooling is DIFFICULT. It is a unique type of stress we shoulder as homeschooling mothers. For the majority of last year I seriously considered GIVING UP. Throwing in the towel. Quitting. It was just TOO HARD. I know what the tuition is at our local private schools. I know what it would take to put my children in our local public schools because I called the registrar at each school and asked. Believe me when I tell you I was seriously considered GIVING UP.